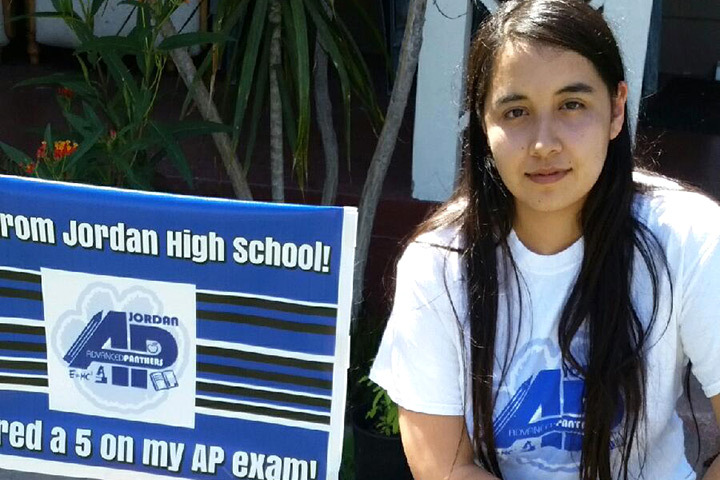 A hundred lawn signs all over North Long Beach are celebrating Jordan High School students who are taking Advanced Placement classes and who earned college credit on AP tests last spring. When students arrived home from school recently, they were surprised by signs designating them as Advanced Panthers. School staff ventured out to plant the signs in large lawns, in front of neat homes, tiny strips of grass bordering apartments, and next to duplexes. As families realized the signs announced that a serious scholar lives here, the reaction was uniformly positive. AP Coordinator Sondra McNair embraced the idea when she heard about it from a school in a similar neighborhood in South Chicago. Jordan’s enrollment in AP classes has increased significantly in recent years. This year, 41 percent of eleventh and twelfth graders are participating in at least one AP class, up from 16 percent just three years ago. ADVANCED PANTHERS – Jordan High School senior Maria Lara and about a hundred of her classmates have been recognized with lawn signs for outstanding work in college preparatory courses and on exams.